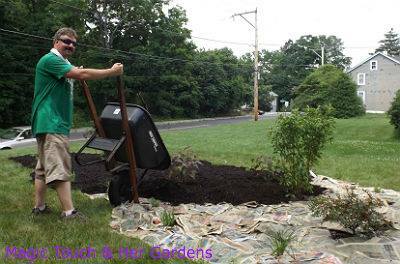 Installing an Island Garden is doable in one day. 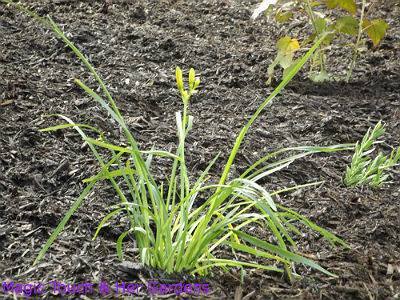 Here I will show you step by step how to create a beautiful Garden that will remain weed free for seasons to come. 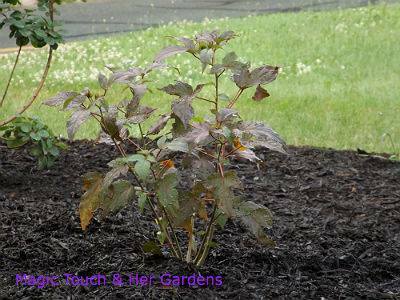 I also placed an Island Garden under an existing Yellow Birch. This Garden has shade plants. 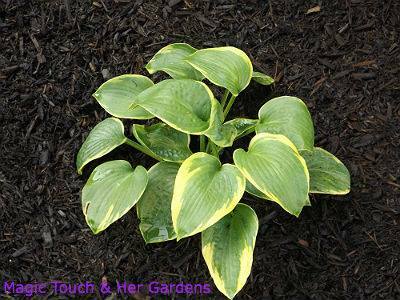 Hosta, two different varieties of Liriope, Coral Bells, and Golden Vinca as a ground cover. 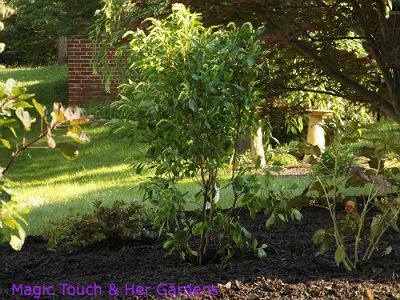 When creating an Island Garden, first you need to chose your location. 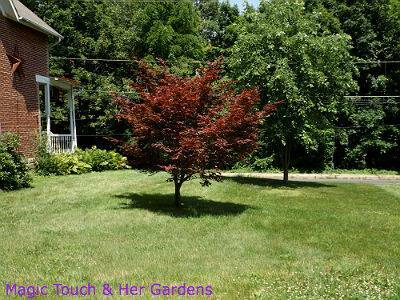 The location we chose spans the length between the two trees. Using a Landscape calculator, determine your square footage. 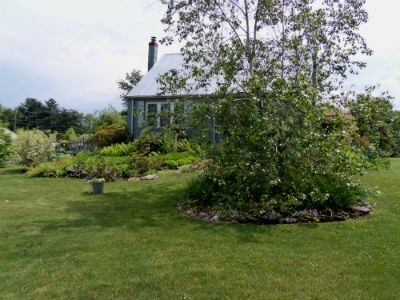 This Garden is about 300 sq feet. 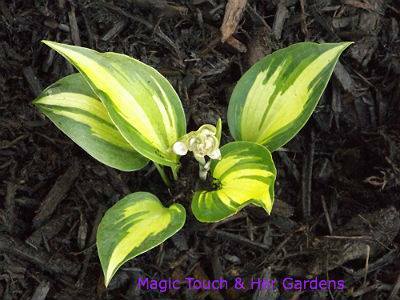 Chose your plants according to the site. 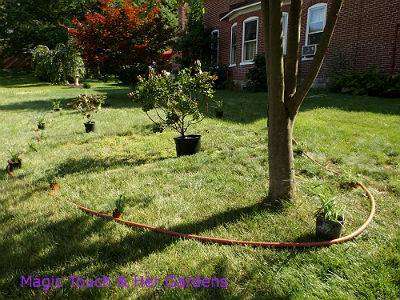 We then laid a garden hose to find the shape we liked…and placed the plants where we wanted them. This will allow you to move things around until you like what you see. 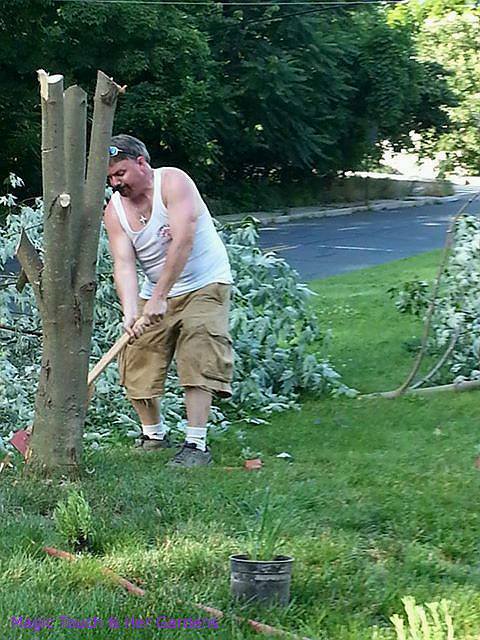 And this would be Mr Brown chopping down a Silver Maple to make way for the Royal Purple Smoketree…. Next step is putting in the plants. Dig your holes 1 1/2 times the size of your pots. Add amendments to the holes and put the plants in. 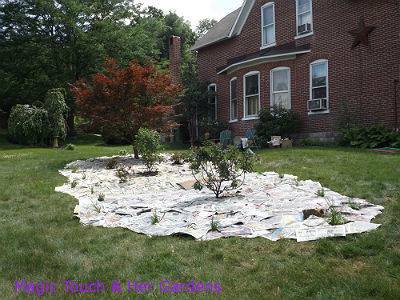 Then cover the entire area with a thick mat of newspaper or cardboard. No need to remove the sod. 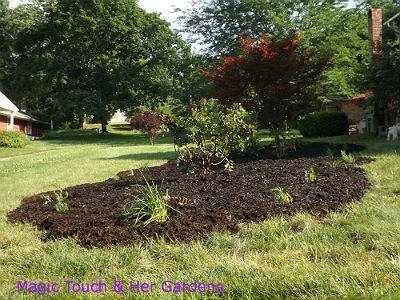 We then applied a 4″ thick layer of Natural Mulch. Mike the Mulchman! Even in the sweltering heat, Mike kept at it. Done! One day, 3 people…Rewards, forever…. 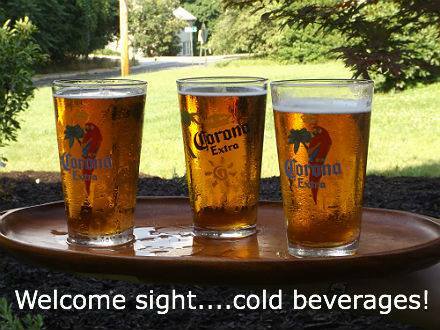 Our reward for a job well done…. 98º, lucky for us the humidity was low…. 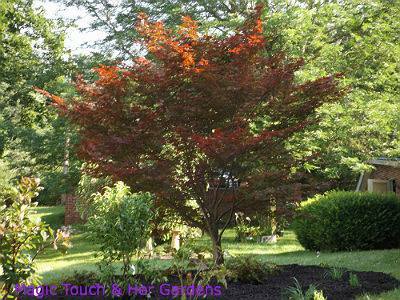 The Island Garden we planted is full sun, except under the Japenese Maple. 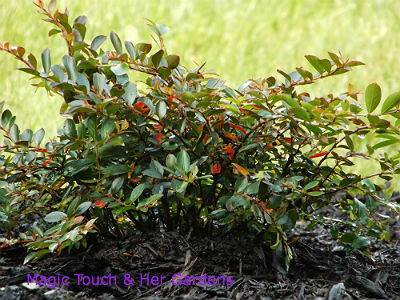 Foliage mounds to 12 in. high, 30 in. 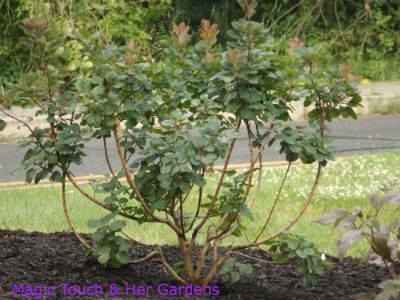 wide; flower stems 20 in. tall. So, in a nut shell, one of the easiest ways to put in a Garden. The only digging required is for the plants themselves. 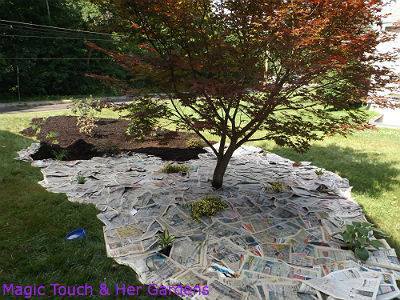 Laying the newspaper causes the grass to decompose providing nourishment for your plants. That combined with the Mulch on top keeps weeds at bay. And if you do get any, they are easy to pull. Having all of the supplies at hand help to get the Garden in in one day. Happy Gardening! This project was built with love. It is enjoyed by the Brown’s everytime we look at it! 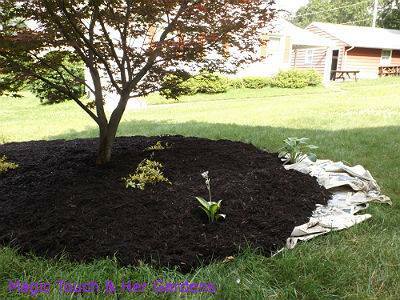 It took a very bland boring area on the side of our home, and made it not only beautiful, but gave the home a warm welcoming curb appeal look. It was not that expensive. It would have never been done without Judy Muche’s expertise and Magic Touch!!! Putting in a Garden is one of my favorite things to do. Working with friends in the process…Can’t be beat. Thank you for allowing my creativity in your yard! 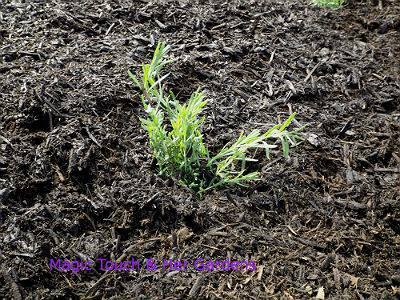 Spread the joy…or was that Mulch. Thank you Shawn & Mike. 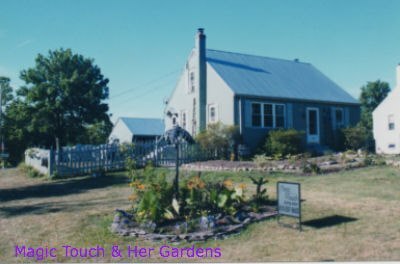 We ended up with a great Garden and great memories to boot!